My grandfather, Mario Quagliata (1907-1995) was the grandson of Mario Quagliata (1843?-19??). Mario was born April 10, 1907 in Termini Imerese, Sicily. His father, Giuseppe Quagliata (Joseph, 1885-1971), had already immigrated to the United States. Giuseppe sent for his wife, Grazia, and son, Mario in 1913 and the family eventually settled in Melrose Park, Illinois, a suburb of Chicago (where both my father and I were born). Mario became an avid vegetable gardener and always had a garden he and his wife Josephine used to save on grocery expenses. 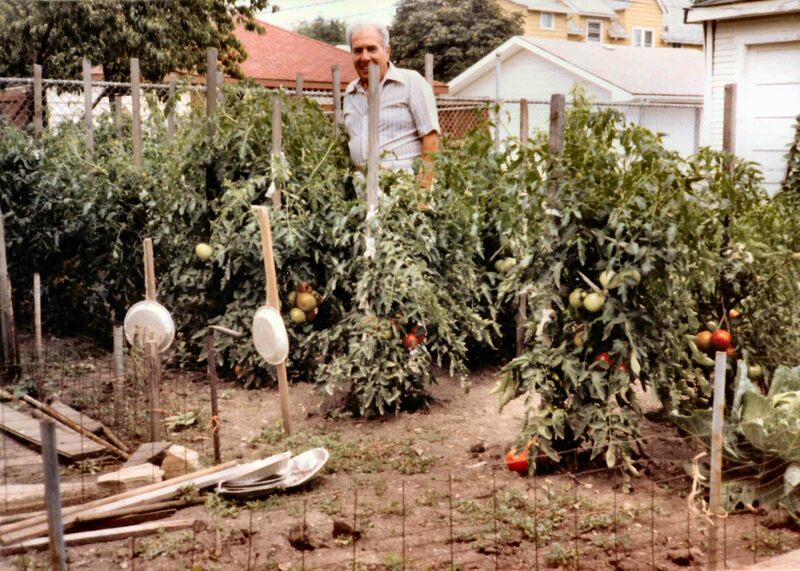 This was very typical of the Italians in the Melrose Park community - when I was a kid just about everybody I knew had a vegetable garden. 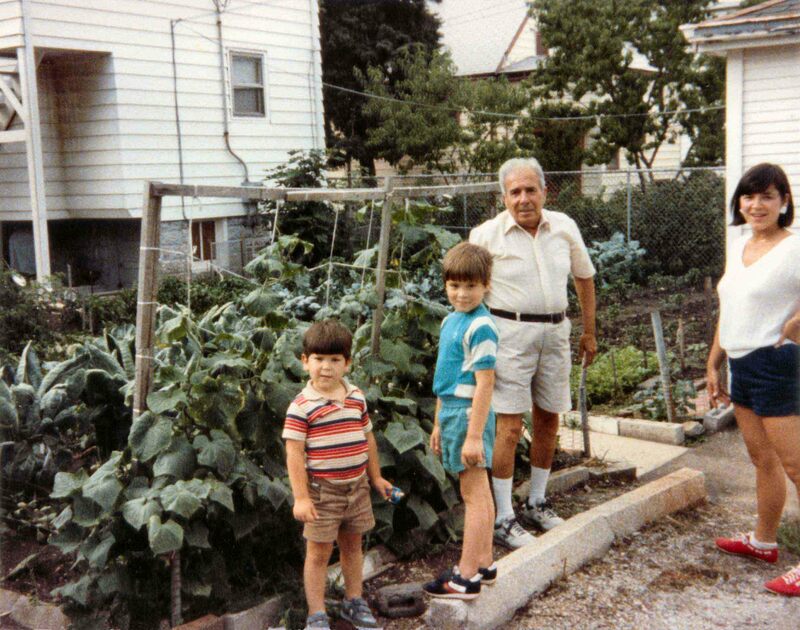 Mario is pictured on the right in his vegetable garden (click the photos for a larger view c.1987). You can see his pepper plants in the foreground of the top photo on the right. Below is another view of his garden, taken in 1985 at age 78, where you can see his beans and cauliflower (click the photo for a larger view). Unbelievably, despite the harsh winters in the Chicago area, Mario had a fig tree in his garden that produced figs. Every fall he would bend it down to the ground, cover it with mulch and plywood and in the spring he'd stake the fig tree back up and it would produce great figs. You can see it near the back corner of the house in the photo below. In the 1980s, Melrose Park ran a garden contest for a few years. In the mid 1980s, unbeknownst to my grandpa Mario, his daughter sent some pictures of his garden to the Melrose Park garden contest and Mario's garden won the first place prize that year. A picture of him with his trophy was published in the Melrose Park Star Sentinel. Mario Quagliata with his great grandsons Joe & Mario Quagliata and their mother, Sue (my wife and kids) 1985. MELROSE PEPPERS - In the 1970s, Mario experimented with a legendary local variety of peppers called Melrose that he had grown for many years - a variety loved and savored by Melrose Park locals and Chicagoans alike. 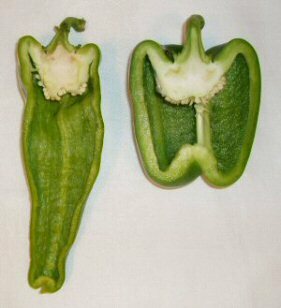 The plants are prolific, producing smaller (3-4 inches), sweet green peppers, shaped like an Italian pepper, that get super sweet when ripe (fully red) and feature a thin skin that is great for frying. The locals love them stuffed, in salads, and fry them to garnish Italian sausage and Italian beef sandwiches. When in season, many restaurants in the area feature Melrose Pepper dishes. 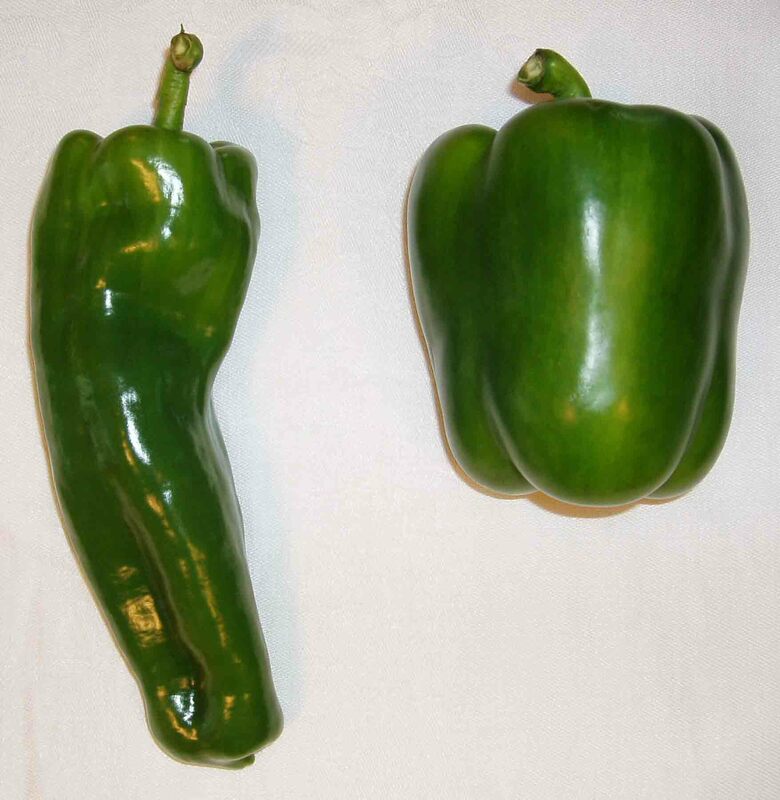 The pepper pictured on the far right is a Melrose pepper (click the photo for a larger view). Judging from my emails, the subject of Melrose Peppers is very popular. So, for those who are interested, I'm going to provide more information. For many years there were two stories about the origin of the Melrose Pepper. The first, and more widely told story goes: Many years ago (probably between 1880 and 1920), an Italian family (possibly from Calabria) immigrated to Melrose Park (which began development in 1871 west of Chicago), and brought with them from Italy a strain of small, super sweet, thin-skinned peppers. The second story goes: Tom Naples, a local Melrose Park grocer, crossed some pepper varieties and produced a sweet, flavorful pepper. Tom Naples' Fruit and Vegetable Market was located on North Avenue, across from the Maywood Park racetrack, from the 1920s until the early 1980s. Some that have emailed have mentioned the fields off North Avenue being used to raise those little sweet and tasty peppers. The truth turns out to be a marriage of those two stories. In a well researched article for the Chicago Tribune by Amy Bizzarri published August 14, 2017, the mystery is solved. Amy writes: In 1903 Joseph and Lucia Napolitano emigrated from southern Italy to America and brought with them seeds that would produce the fruits and vegetables needed to feed their growing family - eventually 15 children in all. They ended up in suburban Chicago, where a handful of the seeds they brought, gathered from pepper plants that once grew wild in the volcanic earth of Nocera Inferiore (a small town about 12 miles southeast of Naples), found success in the rich soil of Melrose Park. The Napolitanos' firstborn son, Tom, grew up working beside mom and dad in the fields, changed his last name to the easier-to-pronounce Naples and began selling the fruits of the family farm at a fruit and vegetable stand on North Avenue in Melrose Park, says his grandson, Tom Naples Jr. Delectable, tender and sweet, Naples named them after their new American hometown - Melrose peppers. I'm happey to say Amy interviewed me for the article and Grandpa Mario became part of the story. As demand for the Melrose Peppers grew, local, small scale farmers began growing them, making them available for sale at vegetable stands and grocery stores across the greater Chicago area. Curiously, the Melrose Pepper remained a local variety for many years, virtually unknown outside of the Chicago area until the 1990s. By then, word had started to leak out about the ultra-sweet and tasty Melrose Pepper. Now, these many years later, I get emails every year about Melrose Peppers from folks that at one time lived in the Melrose/Chicago area, were well acquainted with just how good Melrose Peppers can be, and want to locate plants or seeds. So, for those who are interested, a Chicago area market named Caputo's carries the live plants in the spring and sells some of the local Melrose Pepper harvest as it becomes available. Over the years, word about the super sweet Melrose Peppers has spread far and wide. I've received requests for seeds from as far away as Texas and Washington state. In recent years, as nationwide demand has slowly grown, Melrose pepper seeds have become available from commercial seed catalog sellers who typically describe them as "super-sweet Italian heirloom peppers re-discovered in Melrose Park". 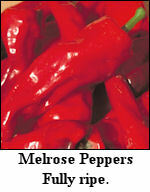 Currently, you can find Melrose Pepper seeds on the Internet by simply Googling "Melrose Pepper seeds". I'm sure you can now see why my grandfather Mario was so interested in this variety of peppers. Now days there are alternatives. In my area, when I run out of my Melrose Pepper harvest, I buy Ancient Sweet Red Peppers. They're not quite as sweet as Melrose Peppers, but have the thin skin and they are up to 10" long. You can check them out by Googling "ancient sweet red peppers". Other alternatives can be found by Googling "long sweet red peppers". These alternatives can be dried, fried, or stuffed, just as you would do with Melrose Peppers. GRANDPA MARIO'S PEPPERS - Getting back to Mario's experiments - they were crosses aimed at increasing the size of the Melrose variety. He crossed them with sweet green Bell peppers, but he was not satisfied with the thickness of the skin. He continued working on his experimental crosses and one day he came across a variety in Florida that the locals called sweet green Cubans. They were bigger and longer than a Melrose, but had a slightly thicker skin. So Mario crossed the Melrose peppers with the Cubans and some of the resulting hybrids were just what he was looking for - 4 to 8 inches long, with some getting up to 10 inches long, while still retaining the characteristic sweetness, flavor and thin skin of the Melrose. He grew his hybrids for several years, making seeds from peppers that met his criteria of thin skinned, large and sweet, and eventually the strain began to breed true. The family simply called them Grandpa Mario's peppers (pictured on the near right). As seen above (click the photo for a larger view), Grandpa Mario's pepper compares well with the size of a Bell pepper. 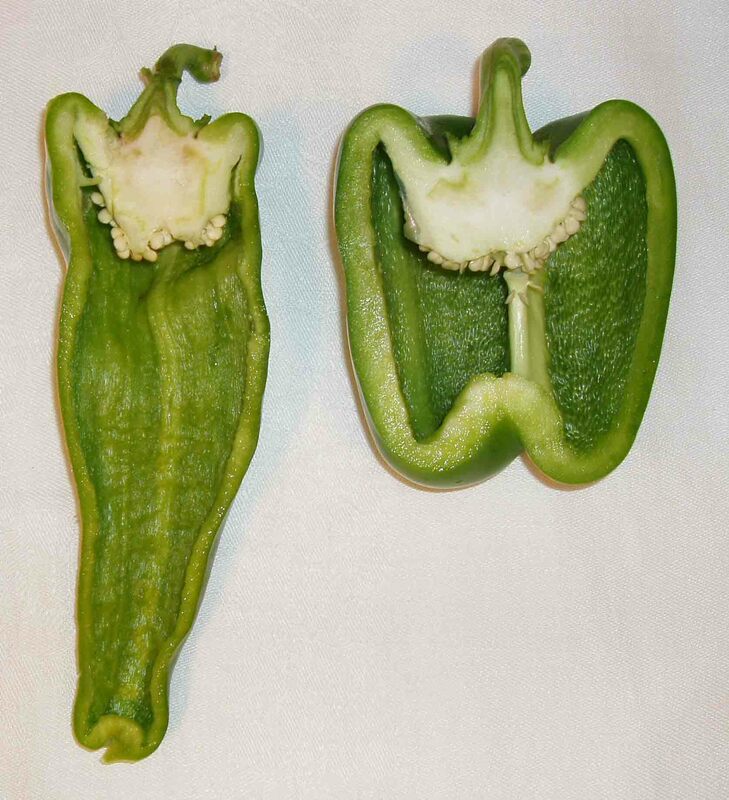 However, the cross section view above (click the photo for a larger view) clearly shows the thinner skin of Grandpa Mario's pepper. Grandpa Mario's peppers are great for frying because the thinner skin significantly cuts the cooking time. They also have a slightly more delicate taste than the Bells. Grandpa Mario's peppers also ripen nicely. If left on the vine, they begin to turn slightly orange and then red, much like a Bell. But, Grandpa Mario's peppers, fully ripened to red (pictured on the right, click for a larger view), have a bright "candy-red" color and a more delicate, sweeter taste than Bells in the same condition - very much like the fully ripe Melrose Pepper - except bigger, look at that ruler, 10 inches! 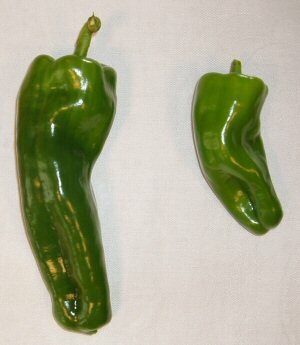 For anyone that has seen fully ripe Melrose Peppers, there's no mistaking their candy-red color (picture on the left). 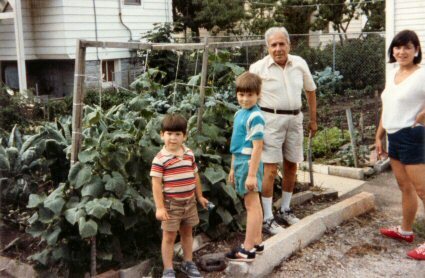 My grandfather Mario taught me (Michael Quagliata) and my cousin Robert Chic all about growing his peppers. His instructions included: 1) Choose an area to grow the plants where there aren't any other types of peppers growing to reduce the chance of cross breeding; 2) Plant seeds made from two or three different generations (years); 3) Pull and remove any poorly growing plants as well as plants making peppers that vary too far from the criteria; 4) Turn over the soil between the plants every couple of weeks; 5) Only make seeds from robust plants producing peppers that strictly meet the criteria; 6) Only make seeds from ripe (red) peppers. 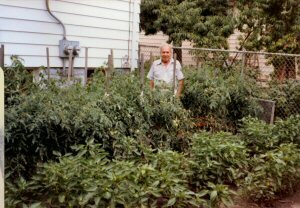 When Grandpa Mario passed away in 1995 he had been growing his peppers for about 20 years. Robert and I have kept Grandpa Mario's peppers going for over 20 years now and they are still breeding true, looking and tasting as good as ever. In October of 2016 we had a family get together. I picked some of my crop of Grandpa Mario's Peppers to stuff for a family get together. 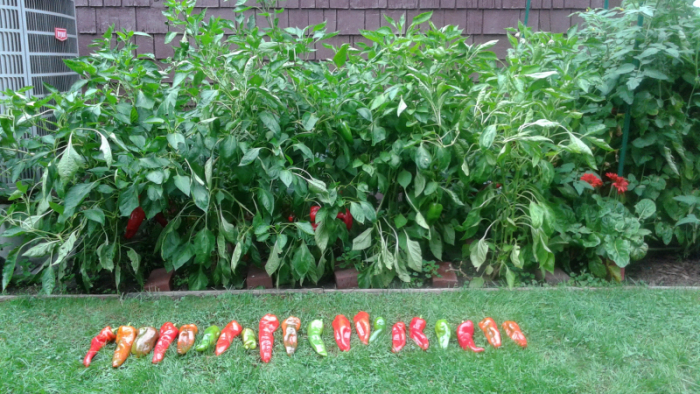 Below is a picture of my garden with the peppers I picked layed out in front.